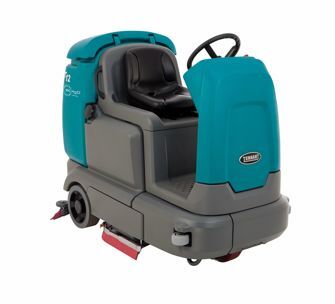 The Tennant 7100 sets the standard for micro-rider scrubbers. The 7100 floor scrubber has a shock-absorbing steel frame and made of durable polyethylene construction. Note: There is an updated version of the Tennant 7100, now called the Tennant T12. Learn more about the Tennant T12. This unit delivers one-pass cleaning to maximize your cost savings. The 7100 is available in Disk or Cylindrical models, both in either 28-inch or 32-inch scrub paths. The 7100 also offers an optional dual vac fan that delivers up to 30% more vacuum lift, providing better pick up over uneven or damaged floors. Two cleaning paths available, 28" or 32"